The second volume of XXXHOLiC Rei, which was released today in Japan, is announcing that the 3rd volume of the series, to be released on August 20th, will come with an original audio drama. The drama’s script will be written by CLAMP member Nanase Ohkawa. 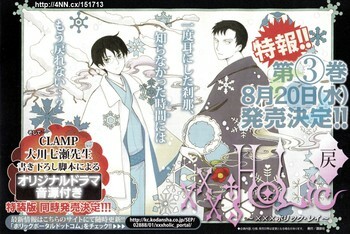 The latest XXXHOLiC Rei volume also updates the number of “XXXHOLiC” volumes to 12.7 million copies sold to this date. Looks like Kodansha is trying really hard to always bring a special bonus for each volume. This looks more interesting than the Blu-ray re-releases, though — in my opinion! It notes not to listen to it until reading volume three, and covers Watanuki looking back (after the events of the end of volume three) and remembering the events in the three volumes one by one for thirty-five minutes, then talking with Syaoran (quoted from pages 5-15 of the new Tsubasa chapter) for the last five minutes to link the story into Tsubasa. The dialogue is mostly all direct quotes from the manga, with the only new bits being Watanuki’s reminiscing linking each part.